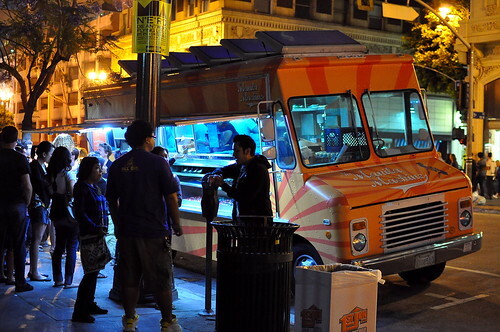 The Manila Machine, Los Angeles’ first and only Filipino food truck, debuted last Thursday night at Downtown’s Art Walk. 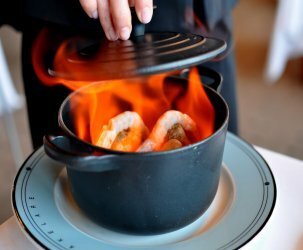 While it’s usually not a good idea to check out an eatery on its first night of service, I couldn’t help myself in this situation. 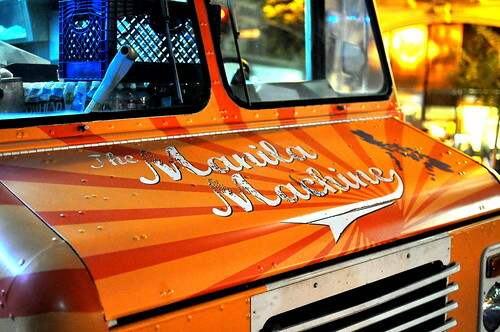 In addition to being the first to introduce Pinoy cuisine in mobile form, The Manila Machine is also the first truck to be owned and operated by bloggers! My friends Nastassia Johnson of Let Me Eat Cake and Marvin Gapultos of Burnt Lumpia are the two talents behind the project. To show my support and admiration, I just had to be present for their inaugural service. The Manila Machine’s menu is straightforward and full of crowd pleasing fare. There are freshly fried lumpias (Filipino egg rolls), pan de sal sliders made using traditional Filipino bread, and a slew of island-inspired desserts. Marvin heads up the savory side of the menu, while Nastassia handles sweets. The truck will also be selling a number of specials each day, including soups and stews. The Astronomer and I hadn’t eaten any Filipino food since our visit to Manila and Palawan nearly two years ago, so we were more than ready for a potent hit of Pinoy goodness. Next, we dug into a duo of sliders ($2.50 a piece). 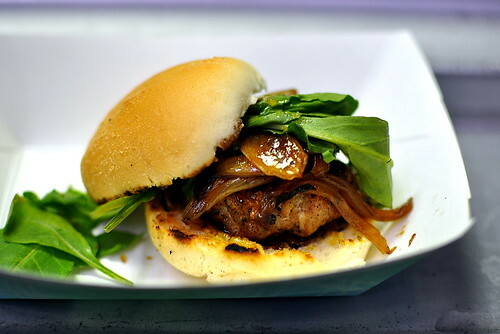 The longganisang hubad (“naked” sausage) slider was piled high with pork and garlic sausage patties, caramelized onions, arugula, and mango jam. The toasty pan de sal held everything together nicely. The slider was definitely tasty, but the jam’s sweetness overshadowed the meat’s lovely smoky flavors. 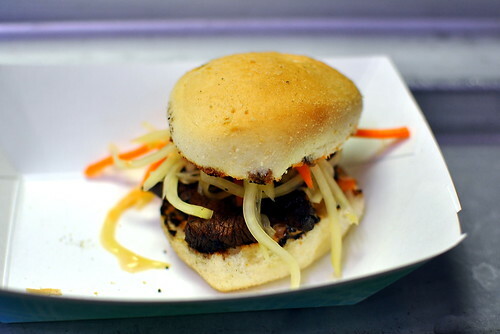 The slider that had The Astronomer and me fighting over the last bite was the tapa (cured beef) with achara (pickled green papaya) slaw, and spicy Sriracha mayo. All of the flavors came together harmoniously and deliciously—this is definitely a must-have item. 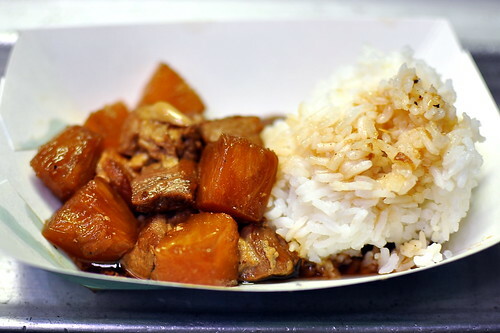 Our final savory item was the pork and pineapple adobo ($6) served with steamed jasmine rice. Braised in a sweet and tangy vinegar sauce, the pork was pleasingly tender and very flavorful. Digging into this homey dish made me feel like a guest at the Gapultos family dinner table. 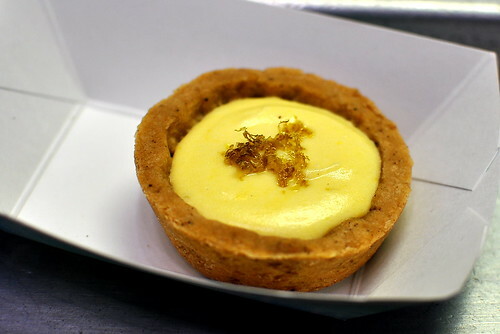 Finally, a kalamansi tart ($2). The texture of the crust and filling were spot on, but The Astronomer and I would’ve preferred a tangier curd—we like our citrus desserts unabashedly punchy. The Manila Machine’s leche flan, halo halo, and ube cupcakes also sounded promising. The Astronomer and I were fortunate to have arrived when we did because The Manila Machine sold out of everything on their first night of service! It seems to me that Los Angeles is ready for Filipino food and The Manila Machine is ready to dish it out. as pinoy food bloggers, carol of carolineadobo and i went there to show our support unfortunately we arrived 30 minutes too late as they were already closed..they sold out. so proud of marvin and nastassia, for teaming up together for this project! congratulations and more power to pinoy food! Wow! Thanks to Malou for reposting this blog. Proud to be Pinoy! Im glad we have actually a Pinoy Meals on Wheels. More power to Pinoy food! Cool. I’ve never really had Filipino food before so I’m really excited to try the Manilla Machine (and get my meat face on). thanks Cathy you are the best! come back for some chicken adobo and you know what the Astronomer is right I’m making that curd more limey 🙂 i will report back with the results. the sliders look soooo good. haven’t had pilipino food in a while. This is great!! I remember someone tweeting about them two weeks ago. I actually just came back from the Philippines and everyone opportunity I can I like to eat up Filipino meals. I’ve got try and catch them when they’re around. jealous!!! i really wanted to go to THIS artwalk solely for manila machine… the kalamansi tart makes me drool. This is very exciting! 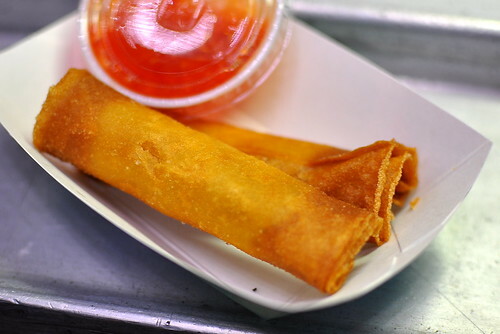 Half my school was Filipino growing up, so I was always lucky enough to eat amazing home-cooked lumpia and adobo. 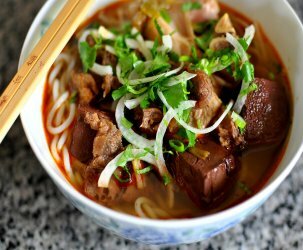 I hardly ever get to eat it anymore–I can’t wait to try this!!!! What a great story this is! I love seeing people follow their dreams, especially when it comes to anything dealing with food. That they’re food bloggers also sweetens the pot for me. 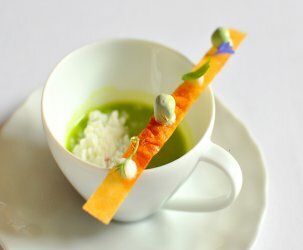 Fantastic looking food. I cannot wait to talk to you about how you light these photographs so well. It’s impressive every single time you post something new. Those sliders and that adobo looks awesome! Your pictures are really beautiful too. I’d love to know how you got them so well lit in what looks like a very tough shooting scenario. Congrats to the bloggers who got this dream off the ground and rolling. I’ll be there to support them as soon as I can! I think this is a truck that even I would chase! Go Nastassia, go! Everything looks delicious but I’m eyeing the desserts. I’m coming for you, Nastassia! How awesome! We have adobohobo in SF, but this looks like the menu is pretty expanded and burnt lumpia behind the scenes no less. Even though I don’t like the new food trucks, I’ll definitely support this one! I’ll have to make the trek from OC to Art Walk one night. Congrats to Natassia and Marvin. Everything looks delicious – esp. the tapa sliders and adobo. Always great photos and interesting posts, Cathy! The seems so delicious! Can’t wait to try how Filipino food taste. Congrats to Marvin and Natassia I believe this will be very successful. I’ll be visiting you guys soon. What a great thing to blog about! Certainly not a typical subject for food bloggers. Once again, great photos. Over priced Filipino food. The pineapple adobo i got was all pineapple and no meat. The other food tasted old and overheated as expected from most non fast-food trucks, since all the food is made before hand and put together when ordered. Might as well go to a Jollibee, its cheaper and taste better.